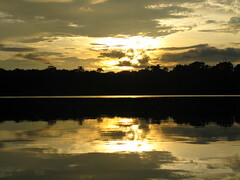 I had been in to the Amazon basin before, in Peru, but Dave hadn’t. We were both looking forward to this leg of the trip. We left early in the morning on a small plane from Quito. After a 30 minute flight, we landed in the town of Coca. We met one of the NWC staff members at the airport and were taken by truck to the port on the Napo River. We waited around there for a little while, watching squirrel monkeys playing and interesting birds (including a toucan). 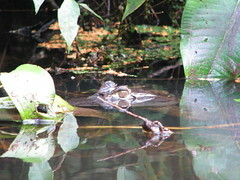 Then we boarded our motor canoe which took us 2 hours down the Napo River. We had lunch on the boat, which was furnished with something like plush office chairs as seats – I was not expecting that! We arrived at the NWC welcome centre, at the mouth of a creek at the Napo River and changed boats to a set of smaller canoes which were paddled by staff members. We were taken another 2 hours up the creek to the Anangu Lake where the NWC is located. 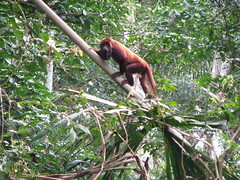 On the way up the creek we saw squirrel monkeys, red howler monkeys, white-faced capuchin monkeys, a huge snake in a tree, and many birds including hoatzin, fly catchers and greater ani. 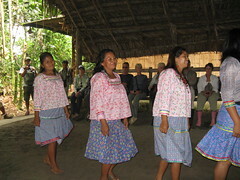 We arrived at the lodge around 4pm where the guide gave us a talk on the lodge and the Amazon in general. We unpacked and settled in before making our way back to the main lodge for dinner with our group. Our first full day at NWC started very early, as would all our other days. We were up with a knock on the door at 5am, breakfast at 5:30am followed by starting our first activity at 6am. We started the day with a 2 hour canoe ride up another creek near the lodge. We saw lots of monkeys (squirrel and red howler), a small white caiman, birds of all sorts, a beautiful blue butterfly which was impossible to take a picture of, and blue and yellow macaws. We got out of the canoe and went for a 2.5km hike back to the lodge. Along the hike our local guide (who is from a nearby community) showed us interesting things like how to weave palm fronds for roof construction and told us about some of the medicinal properties of some of the plants. Along our walk we saw some toads, a small snake which the guide didn’t point out until we had all passed it unseeing – it was right at our heads! – and various types of insects. Back at the lodge we had lunch and relaxed for the afternoon. They don’t schedule activities between about 11:30am and 4pm because it is too hot and humid. So we relaxed in the hammock on our front porch overlooking the lake. In the late afternoon we headed up the tower at the lodge to do some bird watching. We saw lots of birds, including a blueberry tangier, black hawk, smooth billed ani, and weaver birds. After that, we got back in the canoe and went on an evening canoe ride in the lake. 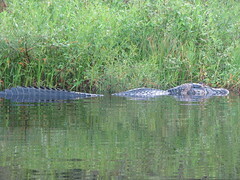 We were looking for caimans, which we saw – they sleep during the day and come out at night – and we also saw a duck billed heron and king fisher. We don’t have pictures of most of these things because of the time of day, and the fact that bird photography is difficult – they don’t stay still for long! We went back to the lodge, put on our rubber boots and headed out on a night walk. It got dark at about 6pm, so we were able to go on the night walk before dinner. We saw a lot of insects, like the click beetle which lights up, grasshoppers, and a scorpion. We also saw a tree frog and I spotted an opossum hiding out high up in a tree. The next day we again started bright and early. We headed back down the creek in the canoes to the Napo River to visit some clay licks. 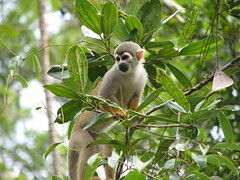 Along the creek we saw a big group of squirrel monkeys playing in the trees and jumping over the creek. It was hilarious! We went to the first clay lick and watched as the macaws arrived in pairs and landed in the trees. From there, once they decide it is safe, they will all go down to the clay lick (in this case a large wall of clay which is part of the riverbank). We saw one macaw on the clay, but all of a sudden we heard all the birds squawking and saw them fly away. The guide told us this can happen when a bird of prey scares them off. When it seemed like the birds would not be coming back again that morning we headed to a cultural/interpretive centre which has been set up by the women of the community that runs the lodge. They put on a traditional dance, and pulled a few of the men up to dance with tem, including Dave! They did not, however, show them how to do the dance, so it was pretty funny. They also have a typical house set up and showed us what it would have been like in the past. The community has a shaman as well, who was there. The shaman is someone who has chosen that pathway and eats hallucinogenic plants and performs ceremonies and rituals to heal people of various ailments. He showed us what the ritual is like on one of our group members (minus the hallucinogens). The next stop was a parakeet clay lick. Having had bad luck at the macaw lick, I was hopeful for this one. Again we watched as the birds came and landed in the trees close to the lick, and got lower and lower in the trees. The noise of the birds was incredible. 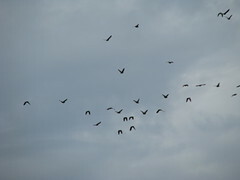 They seemed so close to going down to the lick when all of a sudden they all took off as a bird of prey swept in! It was quite the sight, but unfortunately that meant that was it for the day. We would not be seeing the birds at a clay lick. It was very unlucky! 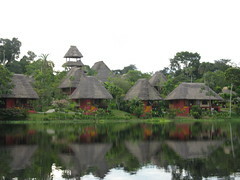 We chose to hike back to the lodge and followed Pato, our local guide, for about an hour and half through the rainforest. We saw some lizards, small toads and a big millipede. Pato also showed us a plant that when cut changes from blue to green which the people use as a dye. In the afternoon we relaxed on our balcony. Dave (bravely!) went for a swim in the lake (keep in mind there are piranhas, caimans, and that little parasite that can swim up one’s urinary tract). In the evening we went for a night canoe on the lake to look for caimans, and we saw several large ones, as well as a lot of bats. 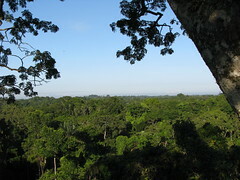 The next morning, we walked along a trail to the lodge’s canopy tower. The tower is 35m high, with a set of metal steps to get up to the platform, which is actually built in huge capoc tree. These trees grow the tallest in the Amazon and we had amazing views above the rainforest canopy. 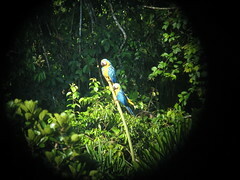 The guide had a telescope and we saw a lot of different birds. It was however a warm sunny day though, which meant fewer birds were active. We saw a toucan, roadside hawk, parrots, blue and yellow macaws, some butterflies, and a lot of other birds. We also saw a three-toed sloth in a tree. On the platform itself there were a lot of little bees buzzing around (they don’t sting but are very annoying! ), and a couple of lizards in the tree. We were on the platform for a couple of hours before heading back down the stairs. On the walk back to the lake, our local guide showed us medicinal plants, cone spider web (the web is shaped like a cone and actually moves when an insect comes near it, trapping the insect), a rubber tree, sour cane, palm nut and showed us how to make rope out of a palm frond. We also saw some very large crickets. We spent the afternoon relaxing and took a quick look at the reed beds that are used to treat the wastewater from the lodge. In the late afternoon, we went for a canoe ride up another creek. We saw some red howler monkeys, a cormorant (not the flightless kind that we had seen in Galapagos! ), some red crested birds and a tiger heron. The hope had been that we might see some river otters that live in the area, but these are quite rare to see and we did not manage to find them. On our final day we were up early, as usual, and had our last breakfast at the lodge. It was pouring rain, so our departure was delayed a bit until the rain slowed. 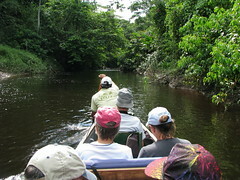 The staff loaded our luggage into the canoes and we were off up the creek to the Napo River. We saw a few squirrel monkeys, striated and tiger herons and some other birds. At the Welcome Centre, we switched to the motor boat and hoped the rain would hold off until we were back in Coca. It didn’t, but luckily the boat was equipped with some sheet plastic which rolled down from the roof and kept us dry. In Coca, we headed to the airport and flew to Quito, and from there we flew home. With that, our three-week vacation to Ecuador came to an end and it was back to December in Ottawa. It was a great trip! !